Tired of being pushed around by water and moisture problems? Take back control with W. R. MEADOWS’ full line of sheet waterproofing products. W. R. MEADOWS has been helping building owners, designers, and contractors fight off the ravages of moisture infiltration for over 90 years. The W. R. MEADOWS system of moisture protection products is designed to work from the ground up to provide you with the best available defense against moisture infiltration for the building envelope. Our line of sheet-applied waterproofing membranes are designed to give you the best possible moisture protection. These sheet goods provide continuous, consistent thickness and have been used in projects around the world. These tough membranes feature strong adhesive properties and will bond with most surfaces. For quality sheet-applied waterproofing membranes, choose W. R. MEADOWS. CLAY-TITE is a dual layer waterproofing consisting of virgin HDPE (20 mil), sodium bentonite, and a protective layer consisting of a non-woven polypropylene. 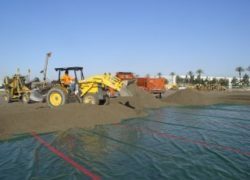 The HDPE provides the first layer of waterproofing, while the bentonite’s self-sealing capabilities ensure positive puncture protection under hydrostatic conditions. The polypropylene fabric protects the bentonite from direct installation of shotcrete. You’ve made a major investment in your building and that investment deserves the very best protection available. There’s only one company that has consistently helped owners protect their buildings against the ingress of moisture through effective sheet waterproofing. W. R. MEADOWS has been recognized as the leader in developing and producing quality sheet waterproofing products for the construction industry. We have built a coveted reputation among architects, engineers and contractors for producing the highest quality products backed by 90+ years of experience. How does moisture enter into my building? Moisture is found in some form or another on every building site. The difference between a satisfied owner and a “problem” project is how you deal with this moisture. By developing systems that are designed to act together to provide complete protection, W. R. MEADOWS can help you design and build a structure that is protected. What makes up the total moisture control package? W. R. MEADOWS manufactures a complete line of sheet waterproofing and moisture control products. When these products are used in combination as a system, they ensure that you have complete control of moisture migration in your facility. 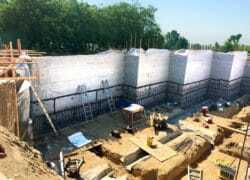 MEL-ROL waterproofing system is a flexible, versatile, dependable, roll-type waterproofing membrane. It is composed of a nominally 56 mil thick layer of polymeric waterproofing membrane on a heavy-duty, 4 mil thick, cross-laminated polyethylene carrier film. PRECON is used as a blindside mebrane in vertical applications where access to the positive side is limited. The membrane can also be used for horizontal applications for underslab waterproofing and vaporproofing. HYDRASTOP SBW is a 60 mil composite, self-adhered sheet membrane comprised of a non-woven fabric, elastomeric membrane, and coated release paper. Once concrete is poured against HYDRASTOP SBW and the concrete cures, a mechanical bond forms that secures the concrete to the membrane. PROTECTION COURSE is a multi-ply, semi-rigid core composed of a mineral-fortified asphalt core formed between two outside layers of asphalt-impregnated reinforced mats. PERMINATOR® underslab vapor barrier can also be used as a protection course for waterproofing membranes. The desired sheet lengths are cut to size and retained at the top of the waterproofing membrane by PERMINATOR TAPE or TERMINATION BAR. PERMINATOR 10 mil is also ideal for use over horizontal applications of MEL-ROL LM. MEL-DRAINTM drainage board is designed to remove moisture from around footings and relieve hydrostatic head pressures. Eight versions are available. MEL-DEKTM waterproofing system provides an excellent waterproofing membrane for bridges, parking decks or other vehicular traffic structures to be overlaid with an asphaltic concrete wearing course. Ideal for repair, maintenance or new construction applications. MEL-PRIME is a solvent-based, ready-to-use adhesive for W. R. MEADOWS membrane systems. It is red to reddish-brown in color. MEL-PRIME W/B water-based adhesive is a ready-to-use compound specifically formulated with polymers in a true water-based emulsion.